Kitchen shears are probably one of the most important tools in the kitchen. Some people use office or craft scissors but then it doesn't really work as good as the proper kitchen shears. So to help you out when it comes to choosing the suitable kitchen shears/kitchen scissors for you, here are the 2017 Best Kitchen Shears in the market today. The very first time I used this kitchen shears, I immediately fell in love with it. The design of the handle, which is made of stainless steel and the rubber grip on it makes it very safe and very easy to maneuver. If you are looking for one of the best kitchen scissors in the world as well as the ﻿best poultry shears﻿ in the market today, then look no further because the Wusthof Come-Apart Kitchen Shears is here. Its blades are extremely sharp that it actually cuts through bones (like a boning knife) without tearing the meat up. Its blade is a mix of a high-carbon and stainless steel which make it durable and it wouldn't rust so quickly. This kitchen shears’ metal comes inwards so that the blade will actually meet in just one place at any position. It cuts very smoothly and it also doesn't require a lot of effort to use it. These Wusthof poultry shears are only great with chicken meat. 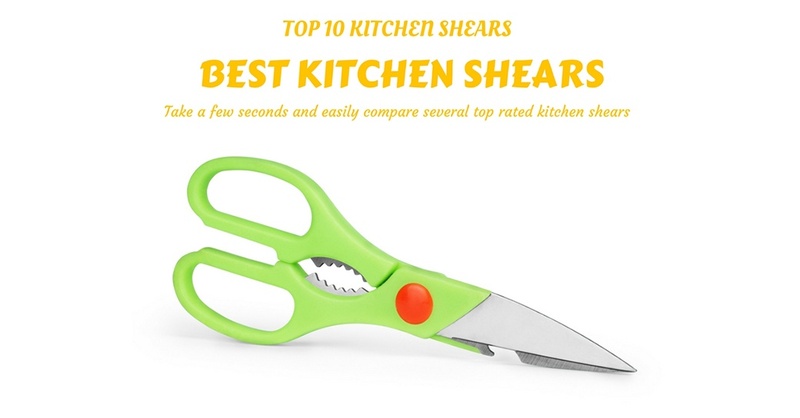 Unfortunately, it is in the second spot because it is not as versatile as the Shun Kitchen Shears. Also, the come-apart feature is too lose that it sometimes separate when in use and can be a little dangerous. 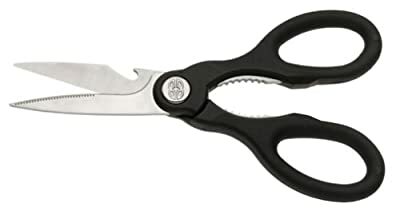 And the final kitchen shears that made it into the top 3 is the Kershaw Taskmaster Kitchen Shears which known to have a good quality since it is made from Japan. Kershaw and Shun are actually owned by the same company that is why their products are just simply amazing. It is very versatile as well which makes it perfect not just for meat but for seafood too. It also features a built-in bottle opener, nutcracker and bone notcher, which is perfect for camping and outdoor cooking. When it comes to versatility and affordability, this is definitely something to look out for. Another amazing kitchen shears are the Messermeister Take-Apart Kitchen Shears that features some very high-quality blades and it is not just some ordinary shears, but it can also be used as a screw driver, nut cracker, jar-lid opener and gripper, bottle opener, bone cutter, and a twig cutter. Its blades are extremely sharp and hardly needs to be sharpened. Because of its come apart feature, it tends to turn into two pieces while it's being used, which is very dangerous. What I really like the most about this one is that it has a very sleek and unique design that it actually looks like a medical knife instead of a kitchen knife. The food doesn't get stuck into the blades which are very nice. 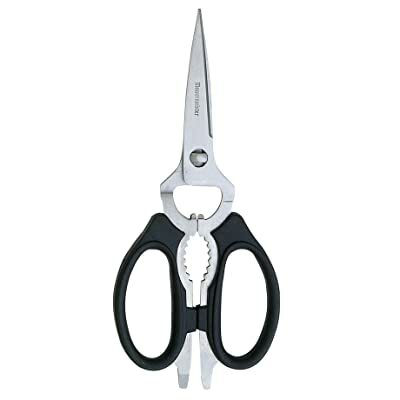 The handles are slippered since the entire kitchen shears are made of stainless steel. 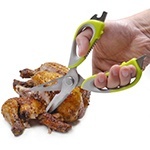 If you are looking for an incredibly cheap kitchen shears but still works wonders then you shall not look any further because the Calphalon Contemporary Kitchen Shears is amazing when it comes to cutting chicken cartilages. Since it is made from high carbon steel, it rusts too quickly. 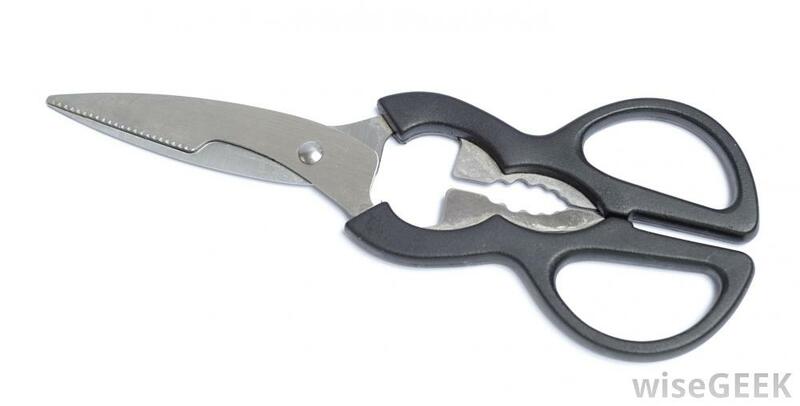 These next kitchen shears come in a unique design which makes it stand out from the others. 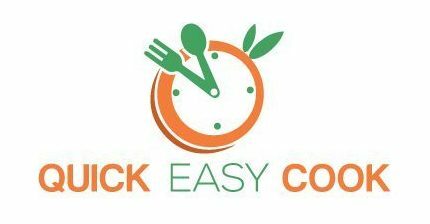 It is very easy to clean which is good if you're in a hurry. It can be dangerous to use while your hands are slippery. When it comes to high-quality and incredible blades, the brand Cuisinart has a reputation. It is versatile and can flowers and cardboards. It is very easy to use since it is lightweight and balanced. It seems more of office scissors than kitchen shears. Last but not the least is probably one of the cheapest kitchen shears in the market today. Although it doesn't work wonders compared to the professional shears on this list, it can work fine for a normal person who just wants some kitchen shears on their kitchen. It has very sharp blades and you can even hang it on the fridge because of its magnetic holders. 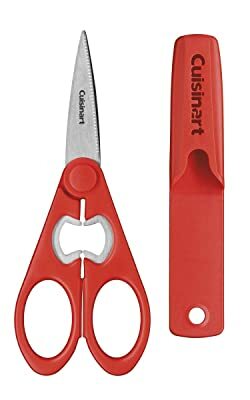 A lot of people tend to think that a pair of scissors is basically the same as the shears but they're obviously wrong. 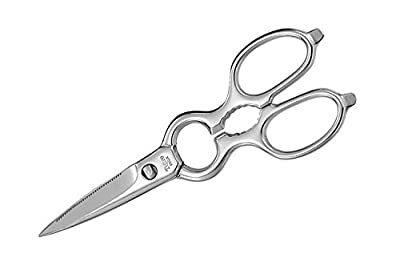 The difference between scissors and shears is that Scissors have this symmetrical shape and has finger holes on it with equal sizes and its blade is generally about 6” in while the shears, on the other hand, have a bigger blades and has two different sized holes, one is for the thumb which is smaller and the other is kind of bigger. 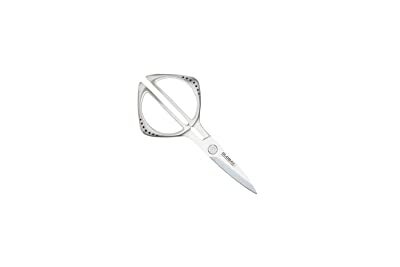 There are a lot of kitchen shears uses, can be used to cut meat, vegetables and even on seafood. It is basically a type of scissors that is specifically made when it comes preparing food. It is technically more versatile than a normal pair of s﻿﻿cisso﻿﻿rs. 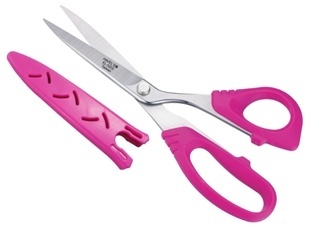 The handle of the kitchen shears is made of either plastic or rubber to allow firm grip with cutting. The blades, on the other hand, is made of either stainless steel or aluminum and must be strong enough to cut through poultry joints and some other type of kitchen shears even have teeth for it to be used when opening bottles and jars. When buying some kitchen shears, the size, of course, must depend on the person. If you have small hands, it might be a little difficult and uncomfortable for you to use kitchen shears that are too big and if you have rather large hands it will be difficult for you to use a smaller kitchen shear so you always have to consider the size even if there are some kitchen shears who have a decent normal size, you still need to make sure. It may seem very easy to go and buy some kitchen shears but it is a little more complicated than you thought. 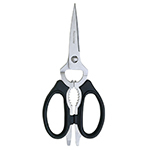 You have a lot of things to consider since kitchen shears come in different sizes, styles, and shape. A lot of people tend to just get the first thing they see and check for the price, whether it is too expensive or too cheap. But there are actually a lot of things to consider when buying some kitchen shears but don't worry it is not that complicated that is why I will be giving you some guidelines when it comes to buying the right kitchen shears for you. 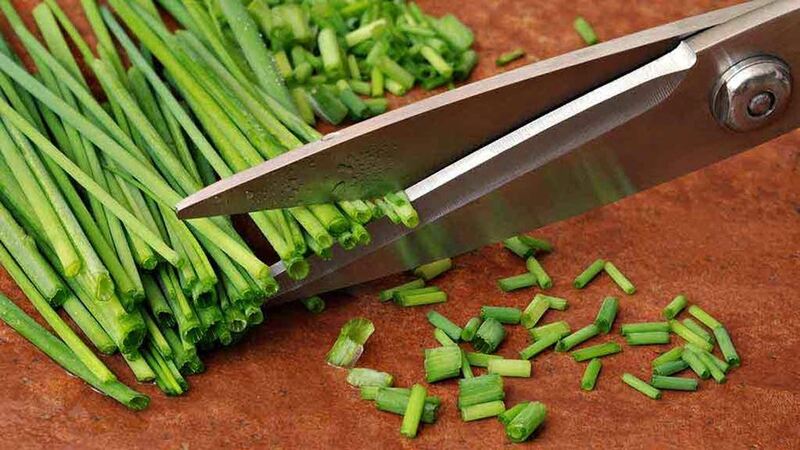 If you haven't noticed, there are two types of blades that are used in a kitchen shear. The straight and the curved blades. The straight blades, on the other hand, is considered as a multipurpose one but then it is quite difficult to cut meat with a straight blade that is why the curved blade is specifically used for it. And it is also normal for someone to buy kitchen shears that would want it to be sharp since you will be using it in the kitchen and dull kitchen shears are rather difficult to work with especially if you're preparing food. Every blade gets dull so you just have to make sure that the blades on your kitchen shears are easy to sharpen. The best steel when it comes to sharpening is the high carbon steel, which is considered to be the best since it is the easiest one to sharpen and it also stays sharp compared to the others. It is also the same as the non-stick coating and the one with a built-in grip system. 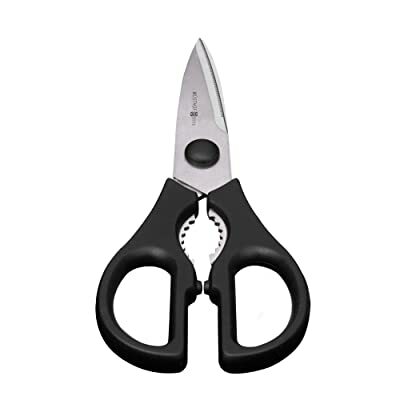 Since you will use kitchen shears while preparing food, you will most likely have wet and slippery hands so for your convenience and safety of course, get kitchen shears that have a non-slip feature. Read Also: What Are Our Favorite Poultry Shears?